Click this smaller version to load a larger one with better detail. Mister Donut is catering to traditional Japanese tastes in what they're calling a "flavor tour". Since the "tour" is made up of only three new products, it's not exactly a long one. 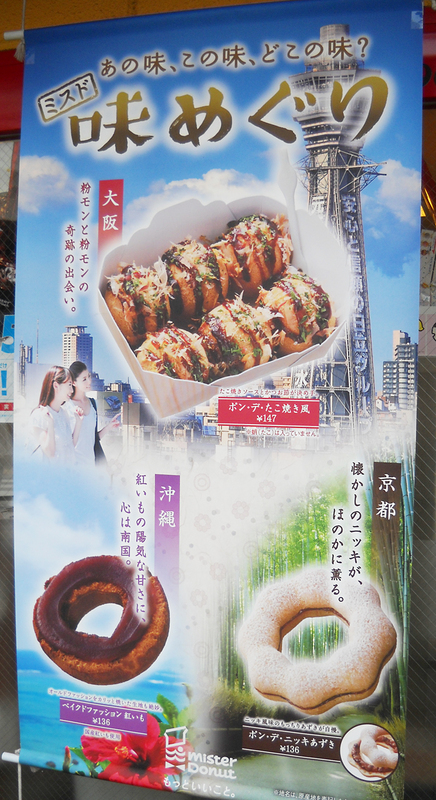 The poster shows a donut version of takoyaki at the top. I haven't tried it, because octopus-flavored donuts aren't my idea of a good time, but the information on "Misdo's" web site seems to indicate this is not faux takoyaki with chocolate sauce and coconut imitating the look of the takoyaki sauce and bonito (fish flakes). It's supposed to be rice dough balls with fishy flavorings on them. I could be misunderstanding the Japanese (it wouldn't be the first time, and definitely won't be the last), but the only thing is says for sure is "octopus not included". The two donuts beneath the faux octopus balls are an old-fashioned covered with sweet potato paste and another filled with a red bean paste and coated with dried camphor bark (aka cinnamon) and sugar. I'm hoping to try the latter, but I'm saving my experience with octopus balls for sampling the real deal one of these days. I love Japanese Takoyaki but I don't know about a Takoyaki donut. I would be put off by the appearance as I like my donuts sweet and sugary. I love MisDo and their constant innovations in the field of donut research. let us know if you get to the bottom of the misdo takoyaki donuts! I'm a fish person, and I embrace anything that resembles fusion, especially desserts but I don't know if I'm feeling this one, it's like I do like the consistency of mochi, but I despise it in donut form.